The next thing we had to do was to pull all of our findings into a proper presentation. 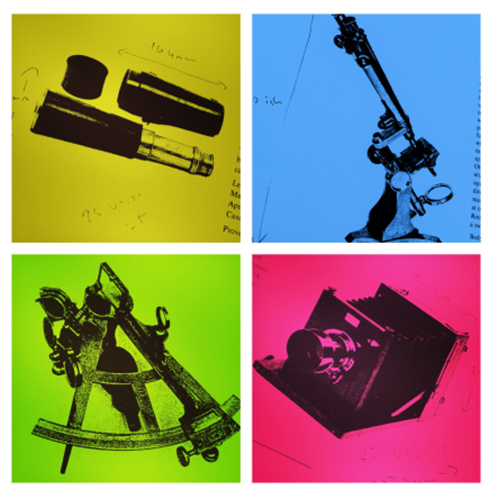 We met up again at the Venture Trust Office in Cumbernauld for a weekend of research, editing and writing, where we worked really hard to create a project which wasn’t just factually accurate but looked interesting too. We decided that we wanted to tell our story and present our research on 4xA2 boards, with as many pictures as possible instead of lots of writing. Once we had agreed what the overall presentation should look like, what should be on each board and how the journey should be illustrated, we split into small groups to edit the pictures (there were a lot of pictures! ), edit and tidy up the journey blog, do more research to make sure we hadn’t got anything wrong and fill in any blanks. It was a fairly intense day with the whole group working hard from around 10 until 4 (on a Saturday!) but by the end of the day we had an edited slideshow, 90% of the pictures decided, the bulk of the captions agreed and most of the blog written. All in all, a good day’s work. The staff suggested that rather than have another day spent in front of laptops on the Sunday we would have a bit of a reward for all of the hard work and go to the Edinburgh International Climbing Arena at Ratho. Only one or two of us had ever climbed before and we had an excellent day out, with everyone pushing themselves really hard. We all set ourselves goals based on what we wanted to achieve and everyone did better than they expected. Simon asked what we’d learned and we agreed that we’d all exceeded our own expectations, which proved that sometimes we needed to step outside of our comfort zones to learn about ourselves and that more often than not we are capable of far more than we believe! With another productive weekend under our belts we agreed to reconvene again as a smaller group in a few weeks’ time to put the boards together. In between these two sessions Stuart sent the proposed captions, descriptions and presentation content to the staff at National Museums Scotland, who kindly proofed them for accuracy and spelling. This meant that when we got back together we could focus on the look of the presentation. When the final session to complete the boards came around we really got stuck in. We met at Venture Trust’s Glasgow office and worked through the final layout. There were bits of paper, glue and photographs everywhere. Stuart said he’d “seldom worked with a more motivated bunch”. Two of the boards illustrating the group’s journey. We had a very productive session and by the end of it we had four presentation boards that everyone agreed illustrated the journey and the experience very well. Now all we had to do was present it…. We decided that the graduation should be held in Glasgow to allow as many family and friends as possible to attend, but that we wanted to host the event in a venue that was relevant to the project. We decided that a museum would be a good choice and after a little bit of research we decided that the St Mungo Museum would be perfect. We decided on the guest list, making sure to invite all of the partners who had helped us along the way. 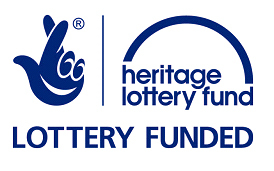 We invited the Heritage Lottery staff who had funded the project, the Venture Trust staff who had delivered the project and the National Museums Scotland staff who had given us a tour and helped with research and getting this blog live. We also made sure to invite Robert and Margaret from our Young Carers groups as they had done a lot to make sure we had the support we needed to take part. 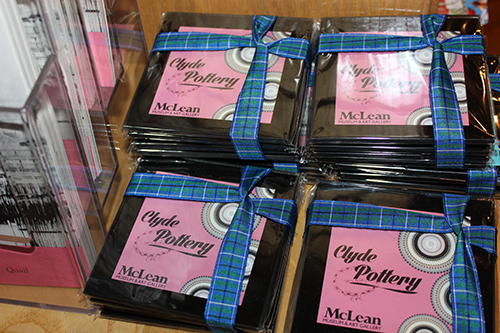 On the day, we set up the boards and the display stands with our presentation and photographs of the journey. Then the guests started to arrive. Lots of the guests were family and friends and it was good to be able to show them the work we’d all done and introduce them to the people who’d been involved. Venture Trust staff explained a bit about the project and how it came about and Sharon read out some thoughts and experiences that one of the girls who wasn’t able to attend had written. We were then called up one at a time for our certificates and a group picture. We had a bite to eat and had a chat with some of the National Museums Scotland staff and they invited us to display our project in the National Museum of Rural Life. We didn’t really expect that our work would end up in a museum when we started out all those months ago but it’s been a great project and we all really enjoyed it. 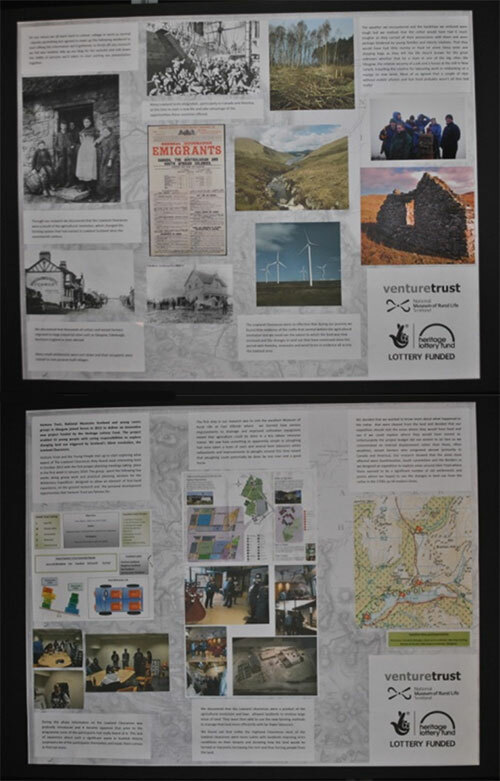 Venture Trust, National Museums Scotland and young carers groups in Glasgow have joined forces to enable 12 young people with caring responsibilities to explore changing land use triggered by Scotland’s silent revolution, the Lowland Clearances. You can find out more about the project in this previous post. During their heritage journey the Venture Trust group set out to experience some of the hardships that cottiers cleared off the land would have encountered as they made their way towards the cities and New Towns in the 1700s. They travelled across Southern Scotland, visiting historical sites and gathering information for their project on Scotland’s Lowland Clearances. Along the way they had to overcome torrential rain, gale force winds, a mountain rescue and leaky plates! The following account is based on the group’s daily journal and outlines their thoughts and feelings each day. We all met up in George Square at around 4:30, where we met up with all the staff that were taking us on the trip. We discussed a rough plan of what the trip would look like. We got on the minibus ready to go on the road trip. We were on the road for about an hour or so when we stopped at Abington services for a break. Then we took another wee while to arrive at Wiston Lodge, where we got our backpacks, clothing, and sleeping bags, and discussed sleeping arrangements. We had dinner and a hot drink, we had a wee meeting in the tipi and went through the social contract we had to all sign, then headed to bed. After a cold wet and windy night we were woken up around 8am where we got freshened up, had a hot drink and some breakfast and headed to the kitchen where we went over our plans for the day. A wet start to the day. Our plan for the day was to climb a hill so that we could see the land in the area and the different types of farming and land use that we could see. We then went and picked our foods for the weekend, got our trangeas (cookers) and packed them in our bag packs along with our tent, sleeping mat and sleeping bag. At around noon we headed off on our journey up to Glentrool and arrived there at around 2:30pm, where we then fastened up our waterproof jackets and helped one another put rucksacks on. When everyone was kitted up we started our walk. 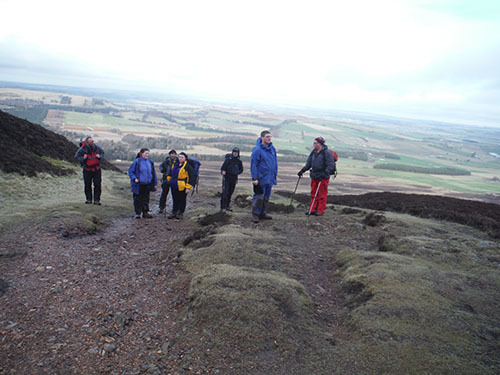 It was wet and windy but the walk was enjoyable because everyone was having a laugh and helping each other when the hill got tough and slippy. Half way up the hill Danielle slipped and injured her knee and we had to stop. As a group we came to the decision to come back down rather than split the group. Danielle was helped off the hill by Mountain Rescue and taken to hospital. At the bottom of the hill we used our trangeas for the first time and cooked some dinner – some people were better at cooking than others! After a long drive back to Wiston Lodge we were given nice hot cabins to sleep in for the night because the weather had got a lot worse. It was a difficult day and we all felt bad because Danielle hurt her leg but we learned how to cope with set-backs and prioritise things and to re-think our plans due to circumstances. After having had a stressful night on Saturday the staff allowed us to have an extra hour’s sleep, we got up and asked Simon and Gee how Danielle was and was told she dislocated her right knee and was picked up by her dad during the night. We had a hot drink, breakfast and went into our support sessions for about an hour where we reviewed the previous day and set our goals for the day ahead, then we had a group meeting and discussed the plan for the day. 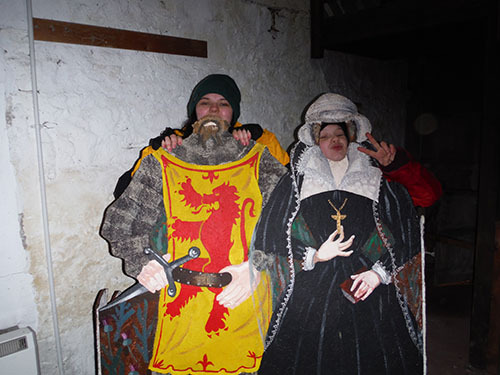 We then put our lunch into our bags, got ready and headed off to a local wax museum to see if it had any relevant exhibits, Robbie Burns was the only wax work who was involved in the clearances but it did have a dry stane dyke exhibit which we found out was how many of the farms were enclosed. We took loads of pictures too. 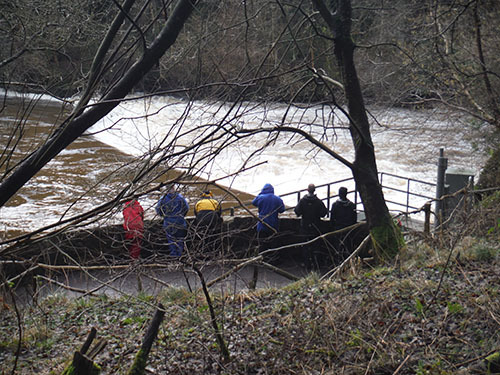 We then headed off to New Lanark and the Falls of Clyde to see a mill where some of those who were cleared off the land moved to work. 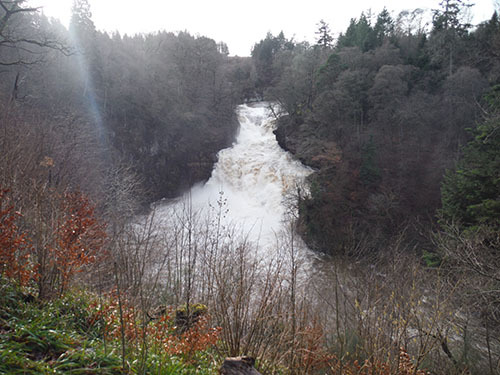 When we got to New Lanark we played a few games whilst walking up to the Falls – one of which was called the Land of Confusion. We looked around the museum and saw the mill and machinery and the houses people lived in. It was interesting to see how people lived at this time and some of those cleared off the land probably had a better quality of life here because the owner looked after his employees. We took some pictures of the exhibit’s historical things and of the waterfalls, which were mesmerising. When we got back to Wiston Lodge we had a communal dinner and a group chat, then went into the tipi and played a few games, had a hot drink then headed to bed. After a nice hot bed to sleep in everybody woke up feeling refreshed, happy and raring to go with the day plan. At around 8:30 we got our trangeas out, made breakfast, had hot drinks and went into our group support sessions for 45 minutes then went over and got our bag packs sorted out and headed off on our journey to Tinto Hill! We arrived at our destination at around 11:30am where we got our kit on, our walking poles and helped each other with our bag packs. Walking up Tinto Hill was such a great experience and I’d do it all over again if I got the chance. There was times when it was quite tough but the encouragement you got off the other members of the team was great and really inspiring, the sights we saw and the pictures we took from walking up the hill were magnificent. We stopped off half way up the hill and had a spot of lunch in the bothy and had a nice wee group chat about our journey so far. After lunch we started walking up the second part of the hill where we took more pictures and had a bit of fun playing in the snow. We took a few wee stops as we were walking because a few people were quite tired and sore but we finally reached the top of the hill and it was such an amazing and proud feeling knowing you pushed yourself to do that and the view from the top was mind-blowing. Simon pointed out lots of the landmarks and we discussed how the scene might have looked before the clearances. It was hard to imagine small crofts and villages instead of the massive farms and forestry we could see. It was a real challenge to climb the hill but it felt great and we all made it together. We arrived back at Wiston Lodge about quarter past four and were to told to be back in the kitchen area around half five to six for dinner, so some people went and got cleaned up and had a shower. Abbie, Dahna and Lauren helped prepare the food for the night’s dinner by cutting and chopping the vegetables and chicken and adding spices and herbs into the big pot, and around half six we all sat down and had dinner as one big group. Dinner was delicious but we used plates that leaked and most of us ended up covered in gravy! After dinner we headed into the tipi and played some fun games including King of the Jungle where we had to do different animal voices and actions. After a few hours of playing games and chatting in the tipi we then had a wee chat and hot drink and headed off to bed. The next instalment will detail the follow-up weekend, where the group reviews their experience, sorts through the huge pile of photographs, compiles a slideshow and tries their hand at rock climbing to push their comfort zone even further! 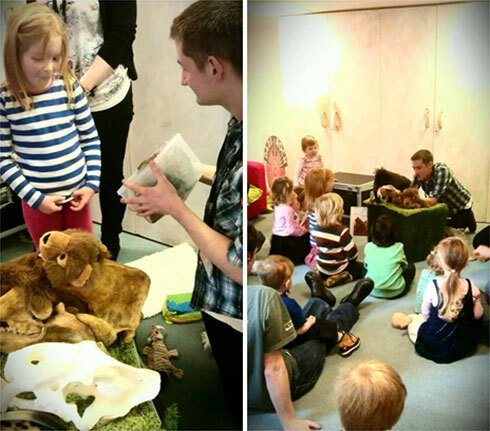 We were so excited about hosting the Mammoths of the Ice Age exhibition here at the museum that we decided to share our excitement through a mini-outreach programme. We ran a series of visits to community groups around Edinburgh and worked on exciting in-depth projects with Knightsridge Primary, West Lothian and the Edinburgh Sick Kids Hospital. We travelled to community groups with our boxes of skulls, teeth and even a real elephant poo. 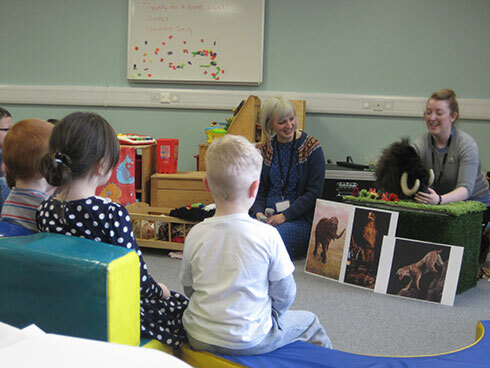 We told Ice Age tales of Mungo the mammoth: poor Mungo has an identity crisis – he doesn’t want to be a mammoth anymore! This leads him on a journey to find other animals he might like to be instead. 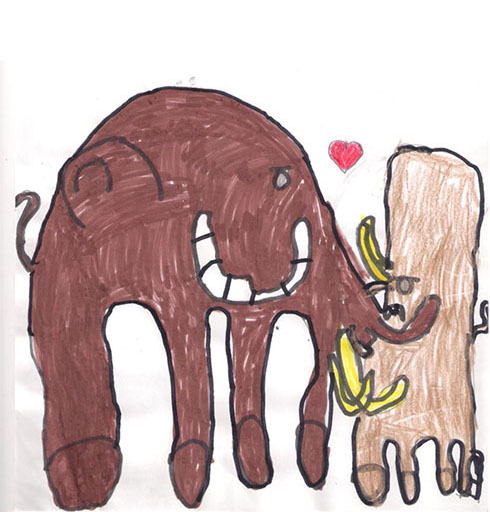 He makes new friends and when a fire sweeps through the woods, he saves the day, realising it’s not so bad being a mammoth after all.Afterwards there was a craft activity where the children decorated a cotton bag in a cave painting style. Conor Hull, Community Engagement Officer, showing a little girl elephant poo at Dads Rock, Westerhailes (left). Mungo and his new friends (right). Above: Conor Hull, Community Engagement Officer, showing a little girl elephant poo at Dads Rock, Westerhailes (left). Mungo and his new friends (right). Across these nine different organisations we reached 177 kids and 150 adults. Seven out of the nine groups decided to come along and visit the exhibition as a result of the outreach. Laura Bennison and Karyn McGhee at Circle Haven, Craigroyston. After our visit to Knightsridge Primary, the class decided to base all class work for the next 11 weeks around the topic. 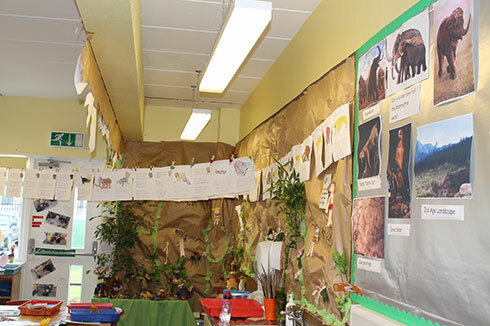 They transformed their classroom into an Ice Age cave, complete with cave paintings. Project work at Knighstridge Primary. They designed their own beasts by mixing and matching real Ice Age animals and they even wrote their own story – the next chapter in Mungo’s adventures! Mungo the mammoth and his mum. You can also download the story here [PDF 1.3MB]. Two classes from the school came in to visit the exhibition on 25thMarch. 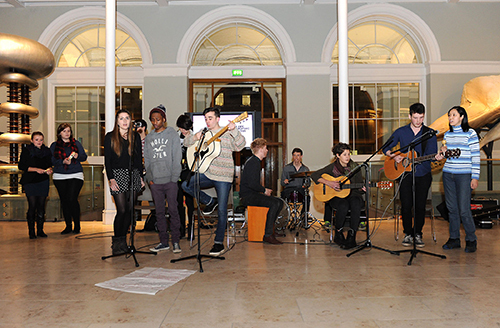 To top it all off we asked our good friends Macastory to come out to the school and perform the show they performed at the National Museum of Scotland over the February half term. 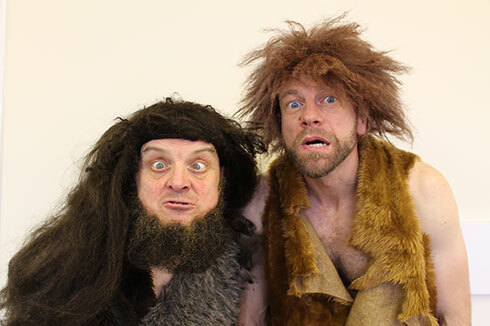 The Macastory crew bring Ice Age mayhem to Knightsridge Primary. 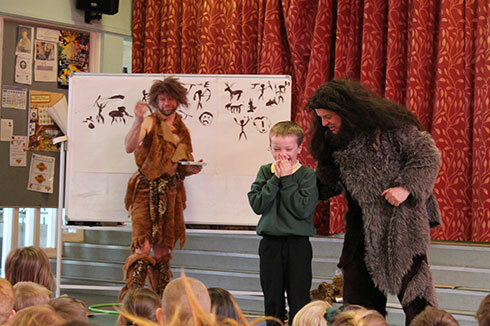 It was a roaring success – lots of fun, while painting a fascinating picture of life in the age of the mammoths. 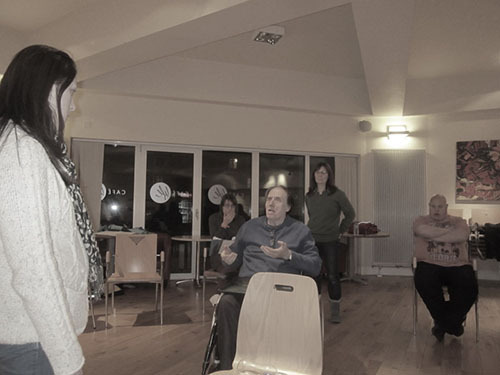 Lung Ha’s aims to be a leading theatre company for people with learning disabilities, in Scotland and internationally. 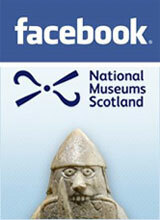 The company presented their promenade performance The Hold at National Museum of Scotland from 12-16 March 2014. Having only joined Lung Ha’s Theatre Company in October 2013, The Hold is the first production I have worked on for the company. My previous experiences of drama have always been as a performer at an amateur level, so it’s been interesting for me to see how it works on a larger scale professional production and from a more administrative perspective. What I’ve witnessed has shown me the phenomenal amount of behind the scenes work that goes into a production. Even before rehearsals began there were script revisions, cast auditions and production team decisions. Left to right: Teri Robb, Anna Walsh, John Edgar, Maria Oller and Mark Howie rehearsing The Hold. Photo by Tom Hutter. As I wasn’t a regular attendee of rehearsals, my connection to the show hasn’t perhaps been as intimate as others, but I’ve always felt wholly connected to The Hold because there are so many other facets to concern myself with, including making funding requests, booking rehearsal space and publicising the show on social media. When I do get to rehearsals, it’s fantastic to see the leaps forward the cast have made since my last visit and I’m always struck by their high level of professionalism. 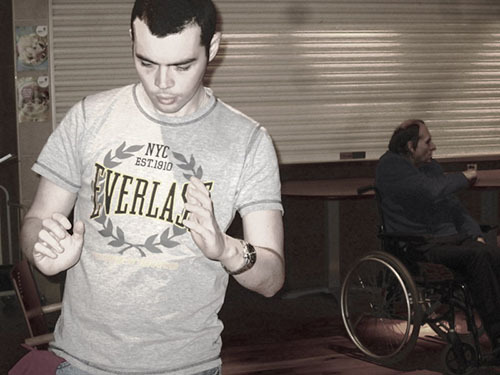 With disabled performers still fairly rare in professional theatre, I feel very privileged to be assisting in the creation of not just a good play (which it is), but a piece that showcases how disabled performers have just as much ability to immerse you in a narrative and evoke a strong emotional reaction as any other performer. Derek Darvell and John Edgar rehearsing The Hold. Photo by Tom Hutter. Although the actor is undoubtedly important, when performing in school productions I was often too quick to let the attention and the stage time give rise to an intoxicating but inflated sense of self-worth. However, working off stage has made me appreciate the production process in a totally different manner. I have watched The Hold grow from a seedling concept into a towering timber giant with various elements (costume, design, marketing, etc) branching off, but all connected together by the trunk. Seeing the play develop like this has brought home how, although the audience may be watching the actors, what they are really looking at is the culmination of a multitude of people’s time and energy and with one missing component, the finished product could look quite different. This idea of shared responsibility has been especially notable because The Hold is a collaborative project with National Museums Scotland. 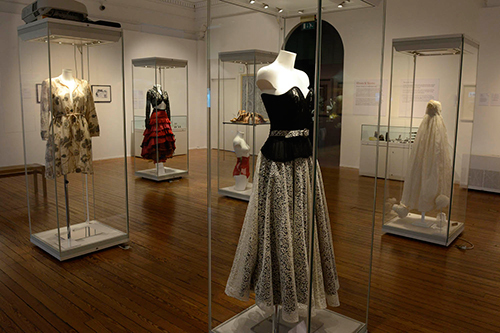 As a site-specific promenade piece inside the National Museum of Scotland, The Hold has frequently thrown up hiccoughs that wouldn’t necessarily exist in a traditional theatrical venue: what to use as a dressing room, how to transport set to a specific area, ensuring the safety of the museum collections, and so on. But with such a wealth of knowledge to draw on, a solution is never too far away. Kay-Ann Jacobs, Kenny Ainslie, Leigh Flynn, Colin McIllveny and Keith Watson rehearsing The Hold. Photo by Tom Hutter. Because the Museum is an institution designed to immerse the general public in its collections and exhibitions, performing inside it gives a sense of immediacy with the audience. Theatre is sometimes associated with the privileged classes, but performing in a museum (a space for everyone) transcends this perceived divide, giving a stronger sense of connectivity between performers and viewers. I have learned a great deal while working on The Hold, but most importantly it has been a hugely enjoyable experience and I look forward to seeing the finished production. 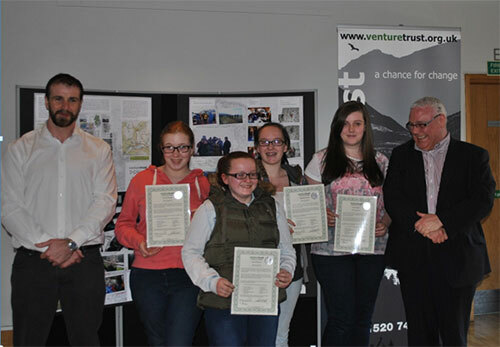 Venture Trust, National Museums Scotland and young carers groups in Glasgow have joined forces to enable 12 young people with caring responsibilities to explore changing land use triggered by Scotland’s silent revolution, the Lowland Clearances, since the 1700s. During the 18th century, Scotland’s traditional system of agriculture changed radically. But as farming methods were modernised and small portions of land consolidated, many cottars and tenant farmers were forced to leave their homes, displaced to the industrialised cities of Glasgow or Edinburgh or seeking new opportunities overseas. 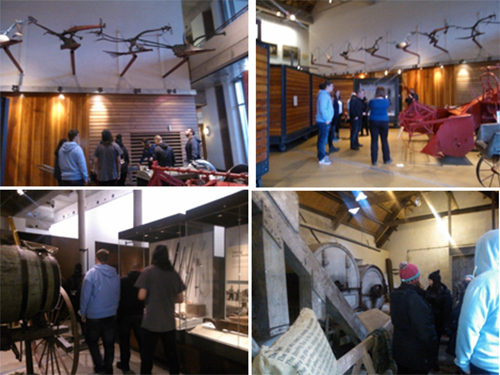 The group’s research in to the Lowland Clearances has already begun, with a visit to the National Museum of Rural Life in East Kilbride. The group of young carers visit the National Museum of Rural Life. Now they are about to embark on an epic journey through remote rural landscapes in Southern Scotland, walking, camping and living in these environments. 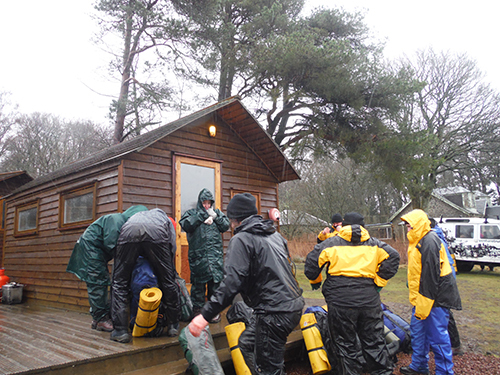 The group will travel down to Wiston Lodge in Galloway Forest Park and finish their preparations for the expedition. The following day they will travel on to Loch Trool, where they will track the shores, taking in sites of historical interest as they go, before camping on Saturday night and Sunday night. Weather permitting, the group will summit Benyellary where the entire area will be visible and the extent of the enclosures will be apparent. The project takes a unique and dynamic approach to engaging young people in experiencing heritage ‘up close and personal’ encouraging them to live, breathe and experience the environment first-hand, learning new personal and technical skills ranging from map reading and personal care in the wilderness to action planning and decision making. Venture Trust is a charity that supports young people and those from chaotic and disadvantaged backgrounds, and helps them to make a successful transition to adulthood. Many of those we work with have been in care, are homeless, or are dealing with issues such as abuse or addiction. 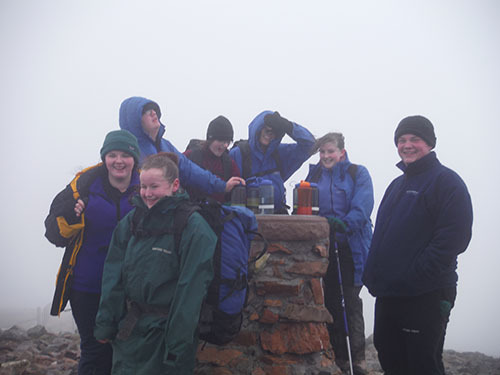 Our programmes give these young people the opportunity to develop new skills and capabilities – by taking them out into the Scottish Highlands away from the influences, stresses and behaviours of their usual environment. The activities they take part in inspire, encourage and support participants to re-evaluate their lives, develop new skills, and return home armed with increased self awareness, self confidence and the life-skills to make their ambitions reality. Long-term community support helps participants to apply their new skills to make and sustain real changes in their lives.